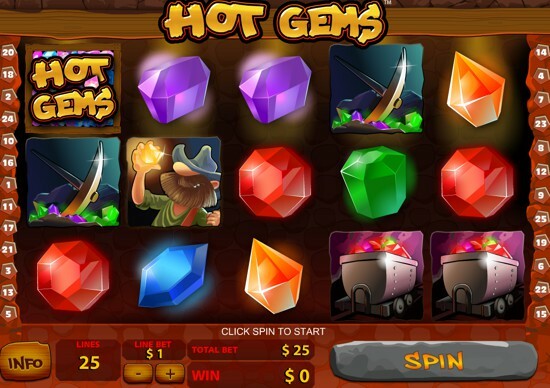 Hot Gems is a new 5-Reel, 25-line Slots game with wilds and scatters, free spins and Collapsing Reels feature. The slot is developed by Playtech and features a mining theme with various gems and gols miner on the reels. Highest jackpot win is 5,000 coins during base game (get 5 of the Miner icons) and up to a huge 25,000 coins on the free spins with help of all the features. In Hot Gems slot machine, each spin can have multiple wins. If there is a win in the spin results, all symbols that participated in any winning combination explode, once all wins of that screen have been counted, and the symbols on top of them fall down and take their empty places. This feature is similar to the one found in the popular Bejeweled Slots game. The reels keep collapsing this way as long as new winning combinations (of gems) are formed. Winning Hot Gems Logo and "Free Spins" symbols also explode. The Collapsing Reels feature is active during both main game and Free Spins. The "Wild" symbol appears on reels #2, #3 and #4 only. It can stand for all other symbols, except scatter Hot Gems Logo and "Free Spins", to make the best possible winning combo. 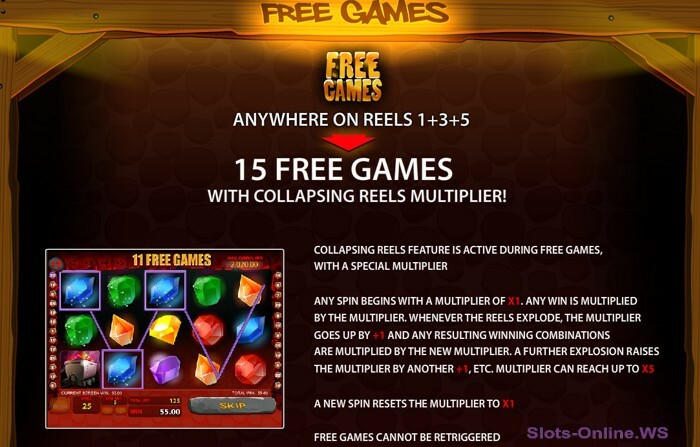 "Free Games" symbols in any position on reels #1, #3 and #5 simultaneously during the base slot game will trigger 15 Free Spins with Collapsing Reels Multiplier Feature. Free Games cannot be re-triggered. Any spin during Free Games starts at multiplier X1. If there is a win, the multiplier goes up by +1 and any resulting winning combinations after the collapse are multiplied by this number. If there is a win in the new combination, the win multiplier will go up +1, and so on. The maximum value for the multiplier is X5. New free spins reset the multiplier to X1. EuroGrand casino - $1,000 welcome bonus (25%) with your first purchase OR 60% deposit bonus up to $/€/£ 500 free. TitanBet UK - 100% match bonus of up to £200 free, plus 50% refund of up to £200 in the 24 hours. From Russia With Love - Bonus Feature 25 Line Slot from Playtech. Cute and Fluffy - Bonus Feature 25 Line Slot from Playtech. Dynasty - Free Spins 25 Line Slot from WGS. Winning Lot - Bonus Feature 25 Line Slot Machine. Bejeweled Hypercash - Bonus Feature game. Girls Best Friend - Multi Line Slot Machine.